Despite facing problems, many people say they are with the government on the demonetisation move but also suggested the process needed better preparedness. 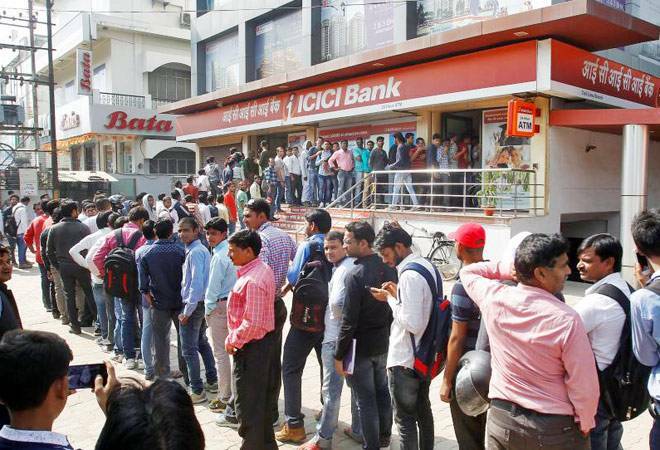 The queues outside banks and ATMs in the city and its suburbs continued to form for the ninth day since the government announced its demonetisation move, as people struggling to get cash expressed unhappiness over the reduced limit of exchange. However, despite facing problems, many people say they are with the government on the demonetisation move but also suggested the process needed better preparedness. Madhusudan Chavan, a retired bank professional from suburban Vile Parle, said, "I fully support banning of Rs. 500 and Rs. 1,000 notes, but it seems that the government failed to take proper steps to deal with the situation arising out of it and that is why people are a bit upset." After exchanging Rs. 2,000 from a post-office, a woman working for an anganwadi centre in suburban Vikhroli said, "Modiji has asked for 50 days and 10 days have passed. Only 40 more days remain and this time will also pass. Then we will have good days ahead." Echoing similar sentiments, one of her colleagues said, "We are in the queue not to change money, but to change the country and we will do it for the sake of the country." However, another city resident, Pradeep Karmakar, expressed his displeasure with the government's decision to reduce the exchange limit to Rs. 2,000. Standing in a queue outside a bank in Vile Parle, he said, "First the maximum exchange limit was Rs. 4,000 and it was raised to Rs. 4,500 following the protests, but now this limit has been reduced to Rs. 2,000. What will we do with a meagre Rs. 2,000?" Meanwhile, the famous Siddhivinayak temple here has seen a rise in donations and offerings following the demonetisation move. Siddhivinayak Trust Chairman Narendra Rane said, "We collect donations and other offerings worth Rs. 35 to 40 lakh each week, but this week it has gone up to Rs. 60 lakh." He also said the trust has stopped accepting Rs. 500 and Rs. 1,000 notes at their counters, but people were still donating these in the boxes kept at the temple for accepting cash offerings.